Okay, I know I've been relying on you guys a lot here recently, but it's crunch time and I need the help! Over the past few days, I've been looking at big church wedding exit pictures (Sorry, I didn't know how else to put it. I hope you know what I mean). 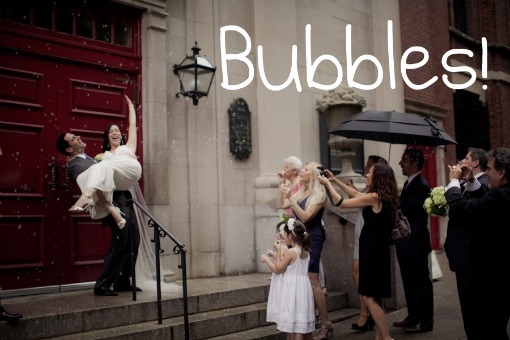 There are so many cute options, but what I've fallen in love with are bubbles, confetti and streamers...and ALL OF THEM are allowed at our church (as long as we clean up before the next ceremony)! Which would you choose to hand out and walk through for the first time as man and wife? P.S. 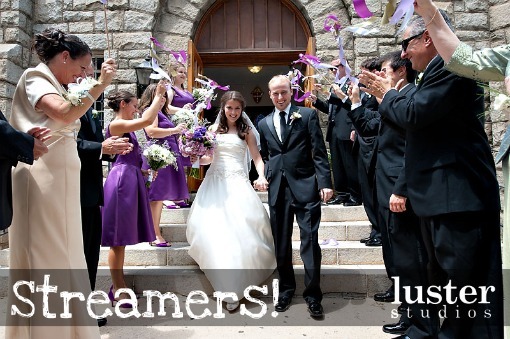 The confetti and streamers can be ordered in our wedding colors. Bubbles less clean up and in my pictures they photographed really well!!! Bubbles is definately the way to go. I like the confetti in the pics. But I really love the look of rose petals. It can be one of those photos done in black and white but the petals are in color! Bubbles. Don't make someone in your family clean up the mess. I like the Streamers..but Bubbles are also good. I like all of the above, but I say bubbles. Less clean up. The confetti is all bio degradable! 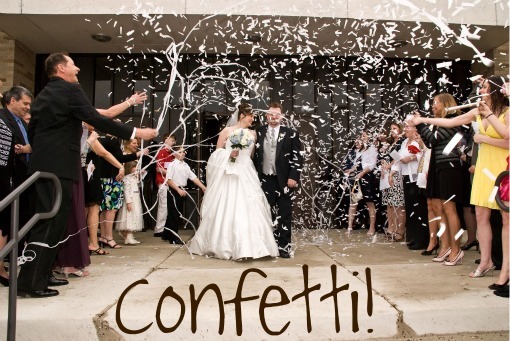 Thanks for using the picture, check out more shots of this confetti online too!